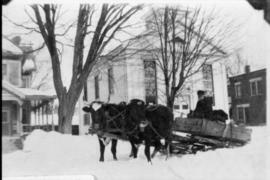 Item is a photograph of Arthur Thompson on a wagon being pulled by an ox team in Johnson, Vermont. Item is a photograph of West Stewartstown, New Hampshire, with the Connecticut river in front. Item is a photograph of the Blanchard homestead near the Indian Stream in Pittsburg, New Hampshire, with people in front. 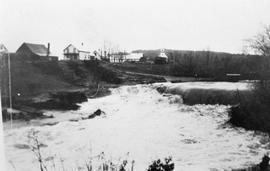 Item is a photograph of farmland located in New Hampshire, with a house in the background and the Indian Stream. The item is a postcard with an aerial view of Newport and Lake Memphremagog from 1907. The sub-series contains information on the life of Mack Derick, photographer, in Vermont from 1979 to 1982. It consists a magazine profile and an obituary. The item is postcard view of Main Street (previously Derby Line Street) and the Derby Line Hotel in Derby Line, Vermont from 1911. The item is a postcard with a view of Rock Island from Derby Line with mountains along Lake Memphremagog from about 1910. Haskell Free Library, Rock Island, Que. and Derby Line, Vt. The item is a postcard showing the Haskell Free Library and Opera House, which sits on the Canadian/United States border in Rock Island and Derby Line from 1912. The item is a postcard aerial view of Derby Line and Rock Island from 1911. Lake Memphremagog by Moonlight, Newport, Vt. The item is a postcard with a view of Lake Memphremagog from Newport from 1907. The item is a postcard with an aerial view of Newport, Vermont and Lake Memphremagog, including a train crossing the trestle, from around the 1910s. The item is a postcard of the Stake Lighthouse at Whipple Point on Lake Memphremagog, near Newport, from around 1905. Federal Building & Court House Newport Vt.